My Antonia tells the stories of an orphaned boy from Virginia, Jim Burden, and the elder daughter in a family of Bohemian immigrants, ntonia Shimerda, who are each brought to be pioneers in Nebraska towards the end of the 19th century, as children. ntonia must work as a servant on the farms of her neighbors after her father commits suicide. She elopes with a railway conductor but returns home and eventually becomes the patient and strong wife of a Bohemian farmer, Anton Cuzak, the mother of a large family and a typical woman of the pioneer West. 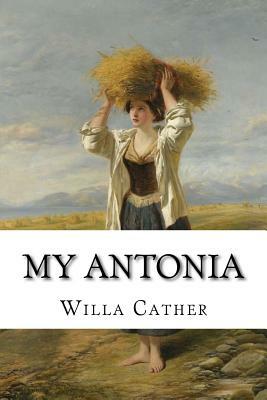 My ntonia is considered one of Willa Cather's best works. It is the final book of her prairie trilogy of novels, preceded by O Pioneers and The Song of the Lark. Willa Sibert Cather (December 7, 1873 - April 24, 1947) was an American author who achieved recognition for her novels of frontier life on the Great Plains, including O Pioneers! (1913), The Song of the Lark (1915), and My Antonia (1918).